BCS130 buckles are made of steel, which was apparently a very common material for shoe buckles. Similar buckles have been found at Fort Ticonderoga, New York, Fort Michilimackinac, Michigan, Fort Quiatenon, Indiana, and on the French ship Machault that was sunk in the St. Lawrence River in 1760. 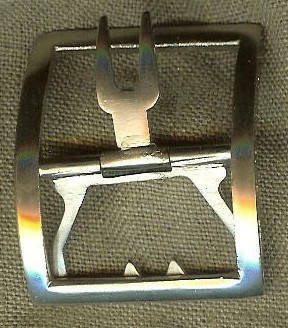 This shoe buckle will accommodate a relatively small strap of up to 1 1/4". This is a good size for women's shoes or early 18th century men's shoes. The overall dimensions are 2" by 1 5/8".